362 pages. ISBN 978-3-906000-03-9. Wil (Switzerland): UniversityMedia, 2014. This is the new English translation (by the author himself) of Schopenhauers Kompass (2011). It contains the revised text, the author's English rendering of all cited passages by Schopenhauer and other authors, and in the footnotes also their original German, French and Latin text. In addition, this book features a new Appendix (pp. 265-299) entitled "Schopenhauer's Favorite Book". "Schopenhauer's Compass is an utterly astonishing introduction to Schopenhauer's doctrine of the Will and its negation that makes them appear in a new, oriental light." Schopenhauer's favorite book was a particular version of the Indian Upanishads. He encountered it just before he found the centerpiece of his philosophical system: his concept of will. Though he named it as the first of three main philosophical influences and kept calling it the most excellent book in the world, 150 years of Schopenhauer research have failed to explain the role of these Latin Upanishads. Based on Schopenhauer's extant copy of the work as well as his notebooks and many additional sources, Urs App's study offers a completely new picture of the genesis of Schopenhauer's philosophy. It explains for the first time the role of Indian, Persian (Sufi), Neoplatonic, and mystical ideas in the birth of his philosophy and describes the central dynamic that gave direction to all of his work: Schopenhauer's Compass. PDF file of the Table of Contents and Introduction of this book for download. 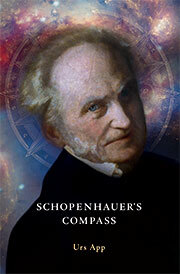 Schopenhauer was the first major Western philosopher to take Asian thought seriously. He became a key figure of the Western discovery of Asian philosophies and religions. From his youth he developed a deep interest in such topics and his works teem with descriptions, quotations, and even lists of recommended readings. From the second half of the 19th century Schopenhauer's views inspired a very large international readership that included artists like Wagner and Tolstoi, researchers of Asian religions such as Friedrich Köppen and Karl Eugen Neumann, and also the majority of early Western Buddhists.